Your mouth feels like a desert, although small streams of sweat have started congregating on your forehead and running toward your eyes. Your hands have fared no better, and you frantically look for a tissue to wipe the clamminess off of your palms — which is next to impossible with your trembling fingers. You wonder if anyone can hear your knees knocking as you walk up to the podium and nervously begin speaking. You stumble over your words, and feel like a fool by the time you’ve finished your presentation. If this is how you feel about speaking in public, you’re not alone. In fact, studies show that fear of public speaking is one of the biggest phobias people have — and in some cases, people are more afraid of speaking in public than they are of getting a serious illness or even dying. And it’s not just introverts who are afflicted with the fear of public speaking — social butterflies may also be affected. 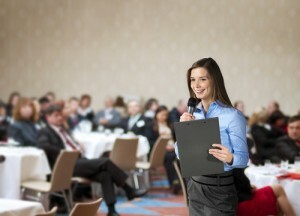 But as public speaking skills become increasingly important for success in school and in the workplace, it’s imperative to overcome this fear in order to succeed. Although it’s not possible to completely get over a fear of speaking in public — even the most experienced speakers get jitters before a presentation — these tips can help you reduce that nervousness. • What are the key ideas I will be talking about? • What do I want my audience to do because of the information I’ve given them? • What does my audience care about as it relates to this topic? • What should my audience care about? • What am I ultimately trying to accomplish with this presentation? By answering these questions, you can determine what points you want to convey in your presentation, while trimming the fat that could potentially overload your audience with information. It’s important to keep your audience’s needs in the forefront, so you can craft messages that will resonate with them and make them feel like listening to you is worth their time and effort. Another reason people get stage fright is because they have not practiced enough. No matter how well you know your subject matter, you’re setting yourself up for a bad experience if you don’t practice how to present it. Doing a series of deep breathing exercises before a speech can help lower your heart rate and give you a sense of calm that reduces your anxiety. One good breathing exercise is alternate nostril breathing, where you deeply inhale with one nostril while covering the other with your thumb. Once you’ve taken in all the air you can, hold your breath for up to 10 seconds, and then cover your other nostril with your finger as you exhale. You can repeat this several times to help calm you down before your presentation. Another effective technique is to take in deep breaths through your nose until you fill your diaphragm, and then exhale all of the air through your mouth. A trip to the restroom before a presentation doesn’t have to be for just the obvious reasons. You can get a little privacy in a stall before your presentation, which can allow you to do your breathing exercises, stretch your legs, listen to music that relaxes you for a few minutes or even practice parts of your presentation. Some speakers erroneously believe that if they write out their entire speech and try to commit it to memory, it will reduce their nervousness because they know exactly what to say. Eventoff says this is a mistake that can often make you more nervous than you would have been had you tried to give your presentation from notes. Instead, Eventoff suggests that you create notes to outline where you want to go in a speech, so if you lose your place, you can easily get refocused without worrying about exactly what you’re going to say. Even the most seasoned public speakers make mistakes now and then. Chances are, your audience won’t notice a mistake unless you make a big deal about it. If you need to correct some information, just make the correction and keep going. And even if you completely bomb during a presentation, the best thing you can do is try another one. People will often avoid public speaking after a bad experience, but this will only make the process seem even scarier — and the more time that passes, the more apprehension you will build up. Kenya McCullum is a freelance writer based in California.